Goodreads: On January 21, 2017, millions of protestors took part in the Women's March, and many of them created a "sea of pink" when they wore knitted pink "pussyhats" in record numbers. The pussyhat swiftly found its place on the cover of TIME and the New Yorker, and it ultimately came to symbolize resistance culture. 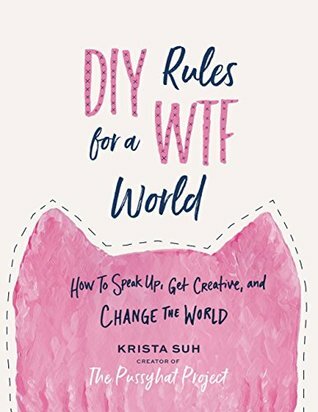 Creator of the Pussyhat Project, Krista Suh, took an idea and built a worldwide movement and symbol in just two months. But like so many women, Krista spent years letting her fears stop her from learning to live by her own rules. 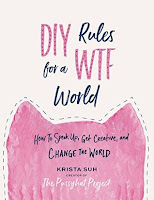 Kritters Thoughts: From the creator of The Pussyhat Project, Krista Suh and this is almost the guide book for women to become not an activist but more active in their lives in their own little worlds. I like that she gives advice that you can use on a personal level, that she isn't saying that everyone should create a movement, but instead should move in their own neighborhood! I love that in the intro of this book, the author suggests to the reader to read it as they wish. 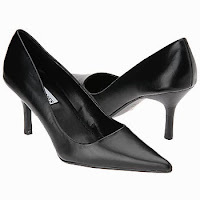 Cover to cover, in fits or spurts or just as they want. That was exactly how this book should be read. I read almost half in one sitting and came out with some homework and then read a few chapters every night for a week - it was perfect. There was so much in this book to digest that I liked sparsing it out over a week. There were honestly some assignments out of this book that I will write down and periodically in the future. One of the big things that stuck out was her thought that you try something for 6-8 weeks, whether it be structure your life more by going to sleep earlier or unstructure your life and plan less, but try something for 6-8 weeks and after that period it is either a habit that you will keep or you can abandon, but you haven't committed that much time to fee like anything is wasted. I love this book and I loved that I read it over the anniversary of the Women's March. It made me nostalgic of last year and the impact this march made on the US and the world. This was a great book to inspire any reader a year later.